My husband and I have never really been into Valentine’s Day. Instead we do some family focused activities and keep things light. I still love that, but this year I’m going to shake things up. My husband is awesome and he deserves a little extra attention now and then. Now, we have a limited budget, no babysitter that night, and an aversion to all things cheesy. Although it was a challenge, I think I’ve done it. I put together the perfect Valentine’s Day date and am kicking it off with a Valentine’s Day countdown! To start planning my big plans, I decided to ask my husband what he’d like for Valentine’s Day. His reaction was pretty much a blank stare and mumbling. I think there was something in there about steak. Obviously, I was on my own to come up with the plan. I started by thinking about what his particular love languages are. What makes him practically swoon with love? (Other than steak.) For my man, it’s words of affirmation and physical affection. Now for yours it might be those or one of the other “love languages”: gifts, quality time, acts of service, football, or Star Wars. Armed with this helpful information, you can start planning the perfect Valentine’s Day date for YOUR husband! I already knew one part of the evening was set. We’ve been really enjoying the expert online massage courses from Melt. They teach massage in a classy, instructive, and completely PG way. SO glad I found that resource. I love that even my clumsy self can use the step by step course for correct back massage technique that blesses my husband and helps him relax without wearing out my hands. Big points from the husband, too! Well, as far as physical affection, the Melt massage course has my back (see what I did there?) but what about words of affirmation? It’s important for my marriage that I tell my husband how I esteem him, expressing my love for him through genuine affirmation. My husband is a techie guy. Even so, we don’t often text each other during the day. That is about to change! Starting today I’m going to surprise him by texting him every day with a little countdown to our perfect Valentine’s Day date! 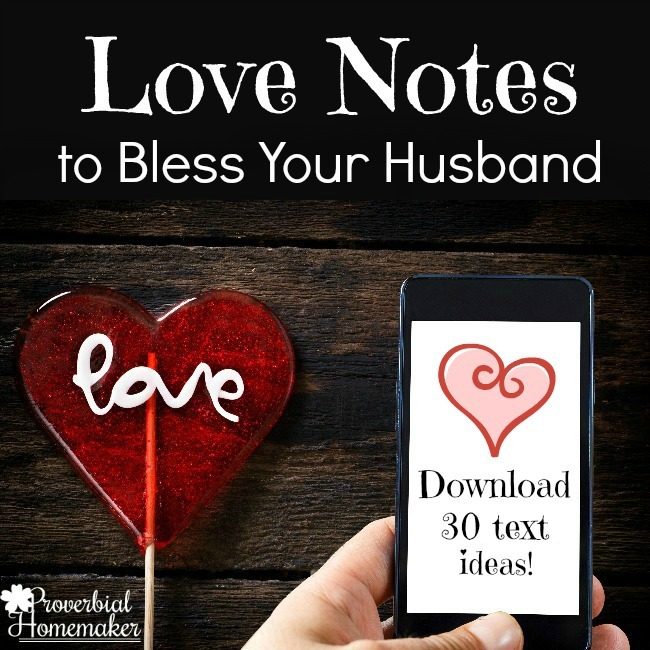 He’s going to LOVE getting encouragement, silly notes, and maybe a little flirting from his wife each day leading up to our date. Do you think your husband would like that from you, too? I’m betting he would! 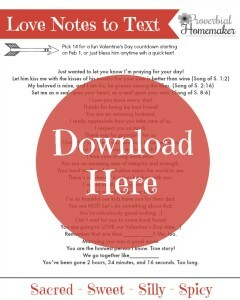 I’ve put together a FREE printable of 30 Love Text Notes that you can download at the end of this post. Just pick 14 and start today! For not being much of a Valentine’s Day person, I’m pretty excited about it this time around! I can just see the smile on his face with each daily text. Then on the evening of Valentine’s Day, we’ll make our in-home date special with a few fun things that really suit his personality. My husband is not the fru-fru type, so this is a date he can totally get behind. I can’t wait! YOUR Countdown to the Perfect Valentine’s Day Date! If you can’t leave the house, need a last-minute idea, or just want to knock your husband’s socks off with a great date that he’ll love, I have the perfect tools for you. First, start the countdown! Download the Love Notes to Text and highlight the ones you will start texting him all the way up to (or after) Valentine’s Day! He’ll eat it up! Don’t forget to check out Melt Massage for Couples! You’ll love adding this to your date night. 🙂 And ladies, this isn’t just a Valentine’s Day thing. We have LOVED this resource for a great at-home date night or just when we want to bless each other after a long day. Melt is having a Valentine’s Day Special! They are bundling up their foot massage videos for FREE with the Melt video series. Total value of $171 for only $99. So many tutorials, you’ll be sharing massages for years to come! Lifetime access to the videos. Over 20,000 couples taught, in more than 50 countries!